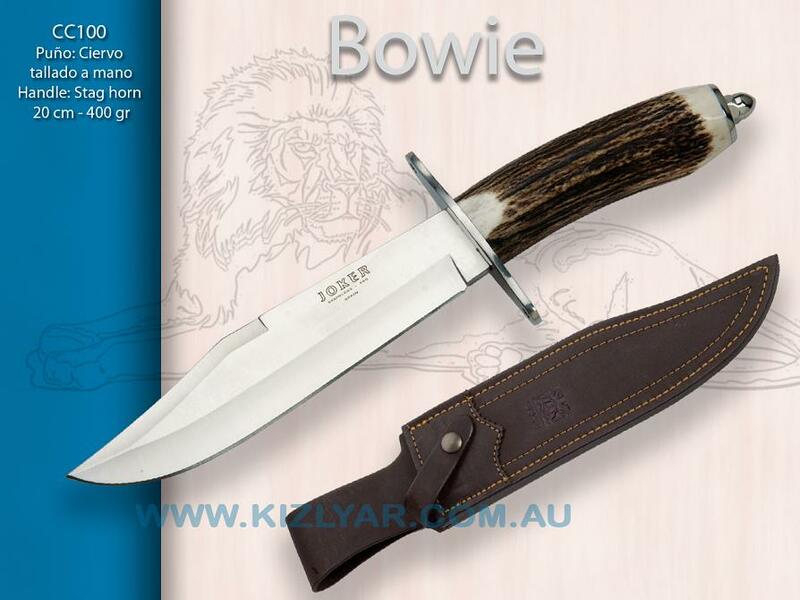 The Joker CC100 Bowie joins the ranks of their larger bowie knife series, this time offering a slightly more traditional straight stag horn handle with a bolt-held endcap. The heavy-duty 5mm thick blade maket this knife great for heavier chopping and preparing tasks. Its extra long cutting edge is ideal for meat preparation, while the overall length is also a bonus if used as a sticker. It must be also noted that, although a very large knife, the Bowie is much lighter and practical that one might think. The Rat-tail tang that runs through the centre of the handle, considerably reduces the weight of the knife making it a very functional piece, which is easy to carry and handle. The knife's balance is superb, and the brass hilt provides great protection for the finger as well as given the knife that classic Old-timer look and feel. The grade of high carbon used in this knife is the German 1.4125 Krupp steel, which is also known as 440C with 1% Carbon rating. This blade is hardened to about 57-60 HRC, meaning that it will keep a good edge, but is still easy enough to touch up and sharpen. 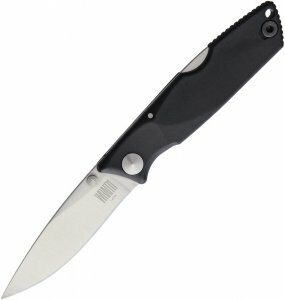 The knife has a straight stag horn handle that gives it both a timeless appeal and a practical grip. It comes complete with a full fitted leather sheath with a single clip and belt loop for safe storage and transport.